In the Worldwide Leader’s annual act of making-so-many-predictions-you’re-probably-going-to-get-at-least-one-right, the panel of so-called experts made their picks for MLB division winners and World Series champions for the 2014 season. The Dodgers and the Nationals were the big winners, snagging eleven and twelve votes to win the World Series, respectively. The Giants…not so much. Thirty-eight of the 44 total experts on the site picked the Dodgers to win the NL West, with three votes going to the Giants, two to the Diamondbacks, and ESPN.com’s Michael Knisley alone sticking his head out for the Padres. The Giants won a surprising 20 votes to win one of the wild card spots. In an unrelated-but-let’s-find-the-silver-lining connection, Pedro Gomez knows Barry Bonds pretty well, and picked the Giants after watching Bonds as a hitting coach this spring. That’s basically a guarantee. 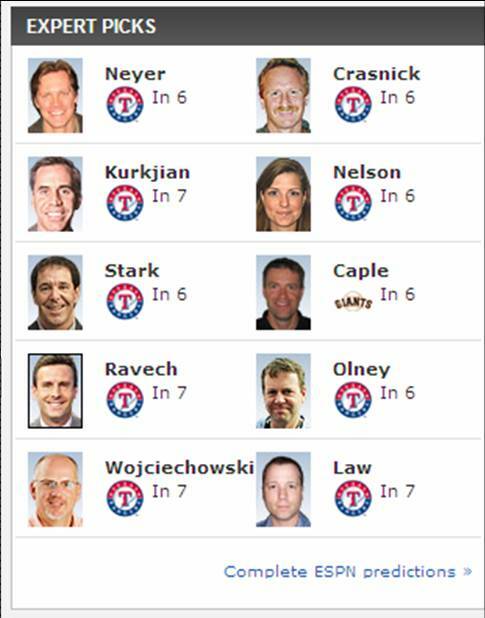 Just for laughs though, let’s look at how the experts did last year! The Tigers won 17 votes to win it all, with the Nationals winning 16 votes. The Tigers did well last year, but the Nationals, if you remember, didn’t even make the playoffs. How many picked the Red Sox to win it all? Zero. How many picked the Red Sox to even make the playoffs? Four… as a wild card. We’re usually way wrong with this stuff. Waaaay wrong. All of us picked the Phillies to win the NL East in 2012. We all picked the Nationals last year. Not picking the Braves is probably always madness, I have no idea. But we’re all likely going to all whiff on one or 24 of these picks this year, too. Bank on it. Bill Baer, who has the clout to throw shade on the Giants from both of the previously mentioned websites, had this to say about his prediction. Either way, expert predictions are ridiculous. We know they’re ridiculous, they know they’re ridiculous, and either way it’ll give us something to laugh at in a few months.